Carlsbad, CA (March 29, 2011)– Earlier this month, the Upper Deck Company, in conjunction with Marvel Entertainment, Inc., released its much-talked-about “THOR” movie trading card set. Chock full of highly collectible cards showcasing many of the most memorable scenes from the upcoming Thor movie premiering on May 6, the 82-card base set consists of 70 regular cards, 11 “Talent of Thor” cards, and one THOR movie poster card. 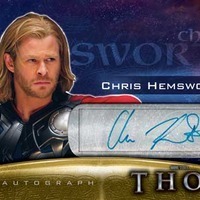 Topping the list of must-haves within the Thor set is its incredible lineup of insert cards including actual autographed cards from the film’s director, Kenneth Branagh, as well as two of the movie’s biggest stars: Chris Hemsworth (Thor) and Tom Hiddleston (Loki). In addition, pieces of actual costumes that were used in the movie have been embedded into movie memorabilia cards to bring collectors even closer to their favorite actors. 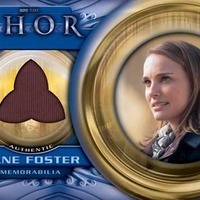 Some of these items include a shirt worn by Hemsworth and pants worn by Oscar-winning actress Natalie Portman, who portrays Jane Foster in the film. Collectors can uncover at least two movie memorabilia cards inside every box. Eye-popping 1-of-1 original “Artist Sketch” cards from renowned illustrators such as Jim Cheung and Jonboy Meyers fall at an average rate of 1:40 packs. Some of the exclusive subsets included boast classic Thor comic book covers (12 versions) and movie concept art cards (13). Actor headshots taken during the filming of the movie also adorn various card fronts. And finally, acetate movie cards depicting pivotal scenes from the film fall at a rate of 1:16 packs, providing yet another great chase for card collectors. Upper Deck’s multi-year agreement with Marvel Entertainment grants the trading card giant the rights to develop future products based on some of Marvel’s various other comic books and Marvel Studios’ feature films, including Captain America: The First Avenger and The Avengers. 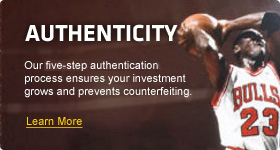 Upper Deck’s THOR Trading Cards boasts seven cards per pack, 24 packs per box, and is currently on store shelves.